The Great Hall was constructed as an original part of Wolsey’s Cardinal’s College. During the English Civil War (1642 – 1646) King Charles I lived at Christ Church and held his parliament in the Great Hall. After the restoration of the monastery in 1660, the college was rewarded for its loyalty to the crown with the result that it was able to finance the completion of Tom Quad, the main quadrangle. 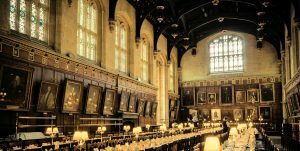 In more recent years, the Hall of Christ Church gained fame by becoming the model for Hogwart’s Hall in the Harry Potter films. Oxford Experience students take all their meals in the Great Hall. The Christ Church 16th century Latin Grace is said each evening before dinner.